This is a continuation of the post from last week (Drone Laying Workers; DLW’s) on possible ways to fix things if you only have small numbers of colonies. 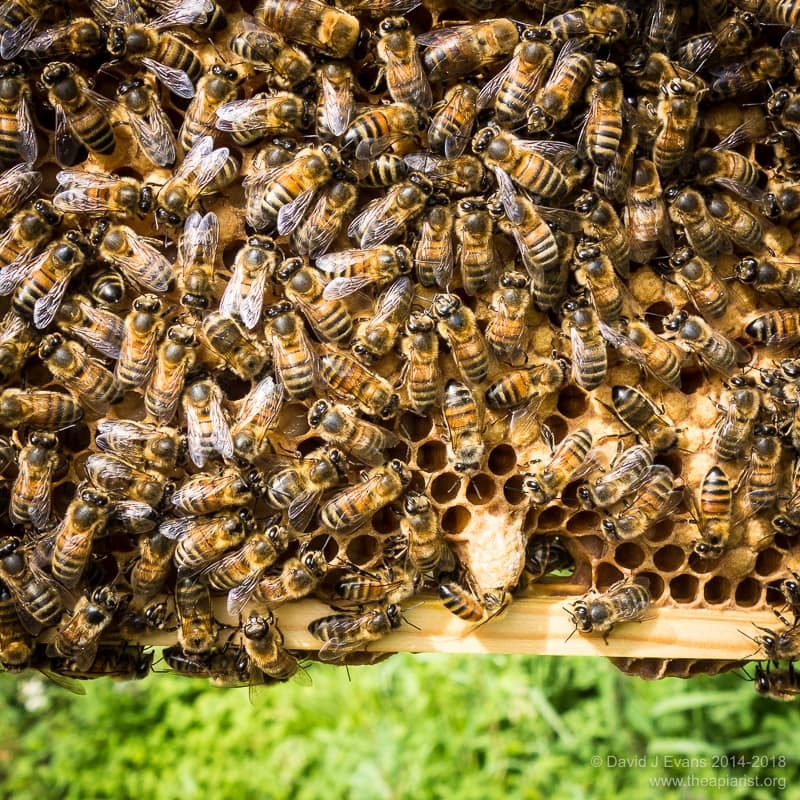 If you have loads of colonies and/or have no interest in maintaining colony numbers you can simply shake the bees out or unite with a strong colony … there’s no need to read any further. However, if you have only two or three colonies and want to keep them then this might work for you. Although DLW’s can clearly return to a colony after shaking them out (see image right and the explanation of what it shows posted last week), the numbers are significantly reduced … or at least look as though they are. To be pedantic you actually can’t be sure the number of DLW’s is reduced without formally testing it … perhaps they’re all still present, just laying fewer eggs? I can’t think of an easy way to discriminate between fewer and the same number doing less. Can you? The second observation is, to me, the clincher. 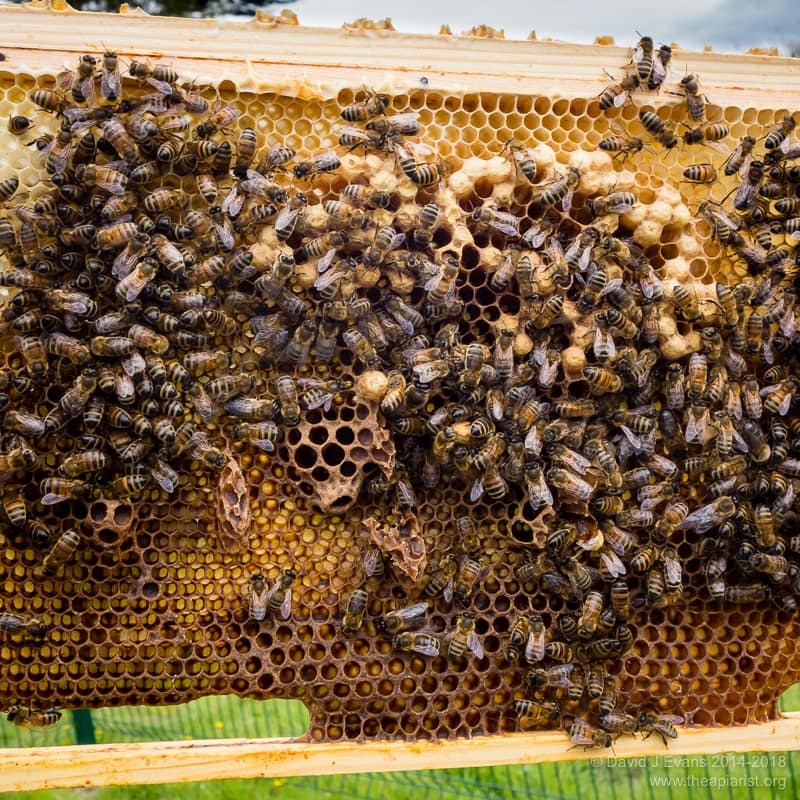 Colonies with well-established DLW’s often completely ignore the first frame or two of open brood added to them. 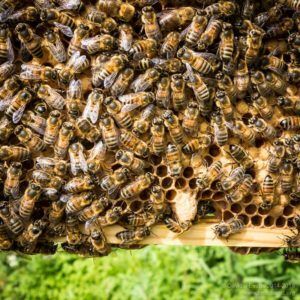 They rear the larvae as normal, but don’t start generating queen cells because they still consider themselves queenright. 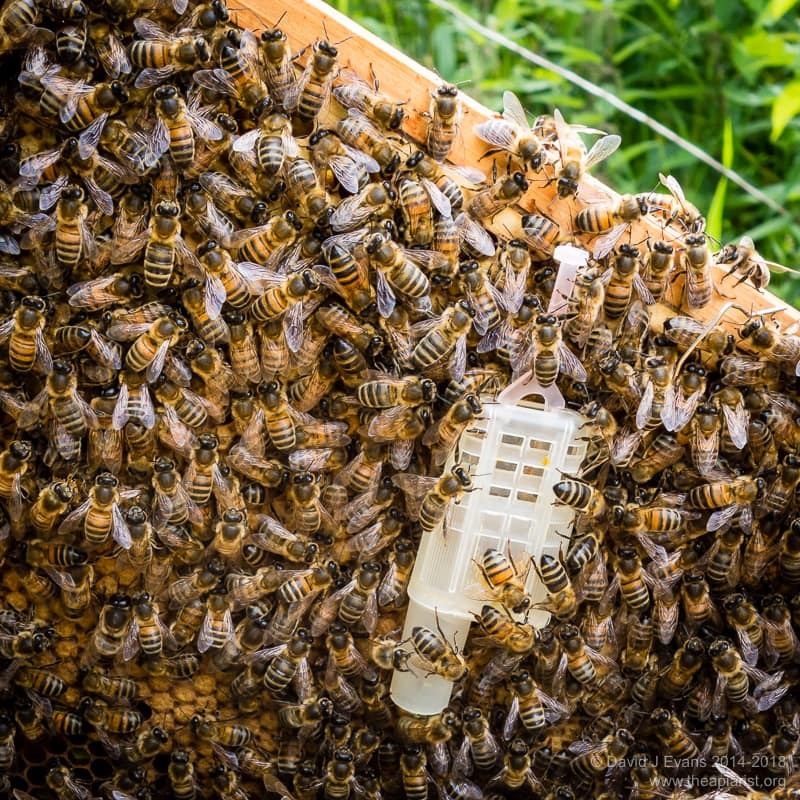 Remember, as discussed last week, it is the open brood pheromone that suppresses ovary development by workers and you may need to repeatedly add a new frame of open brood every few days before you finally overcome this. With only a couple of colonies, the DLW’s might be saved but the other colonies will definitely be weakened. However, if you combine shaking the bees out with the addition of a frame of eggs and young larvae there’s a reasonable to good chance they’ll recognise their queenlessness and start drawing out emergency queen cells (QC’s). Once that’s been achieved you’re in a much better position to rescue the colony. Far better you identify a colony is queenless and resolve that before they are irretrievably broodless. This requires regular inspections and careful observation. 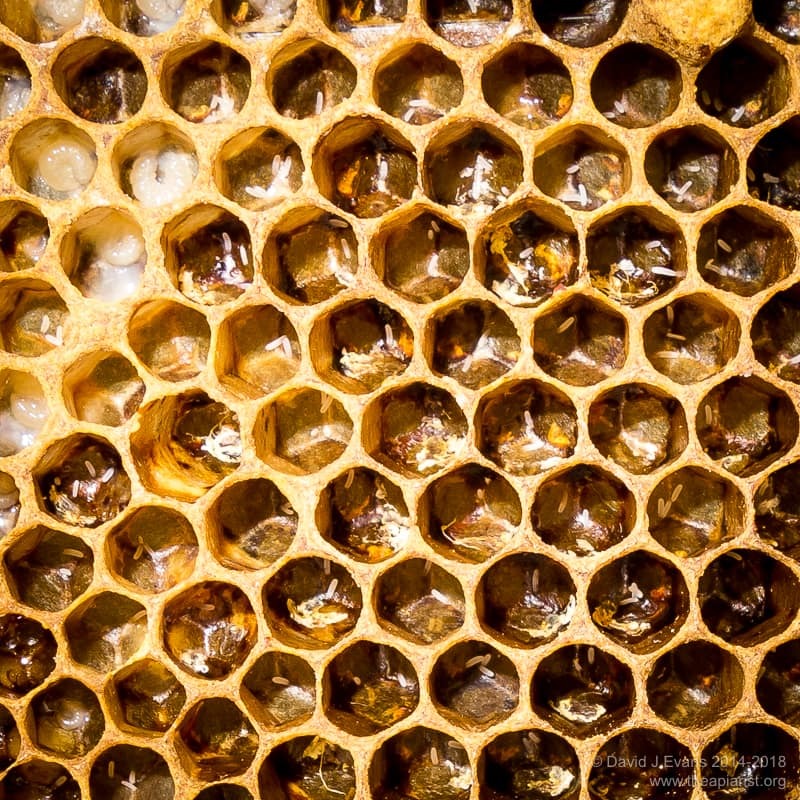 Once the colony appears queenless and devoid of worker brood you need to look for the characteristic signs of a random pattern of drone brood in worker cells and multiple poorly placed eggs. 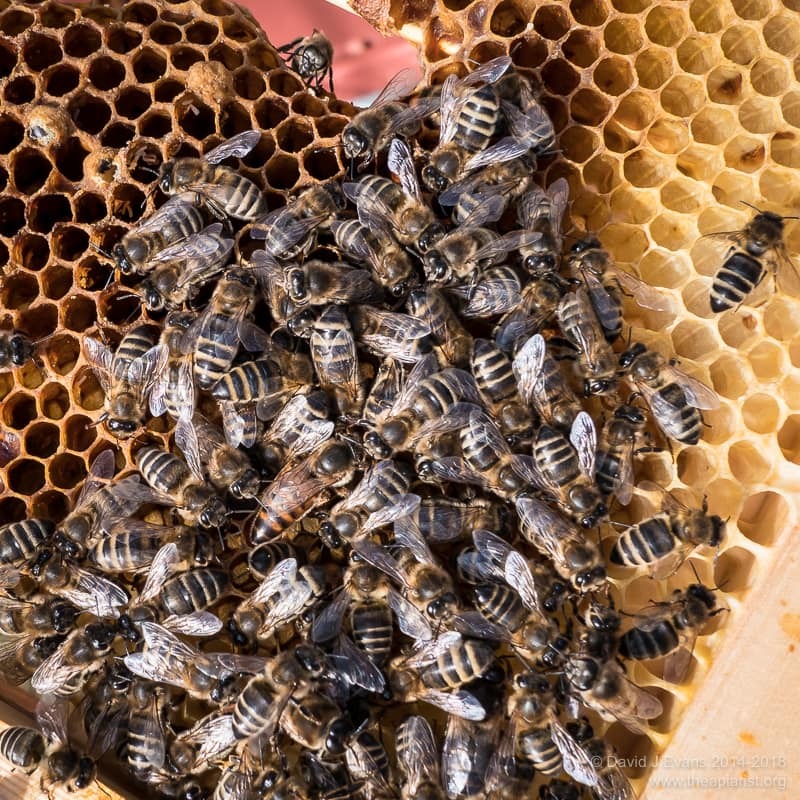 Remember that newly mated queens sometimes lay multiple eggs per cell, but – at least in empty drawn comb – these are more likely to be clustered in the centre of the frame within an area of ‘polished cells’ prepared by the workers. In contrast, DLW’s eggs are usually dotted all around the place (see the image at the bottom of this article). The only other queen problem DLW’s can be confused with is a drone laying queen … in these colonies there is usually a clustered pattern of drone brood (see image right and compare it with the one further down the page), sometime mixed with worker brood if she’s only just starting to fail, in the centre of the frame. If you’re confident in your diagnosis of drone laying workers then don’t delay. 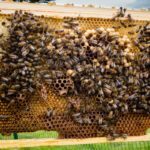 The longer you leave things the worse the situation will get … more workers will start laying eggs, the colony will weaken, the younger bees in the colony will age etc. All of these things makes rescuing the situation less likely. If you’re not confident in your diagnosis then ask someone else. 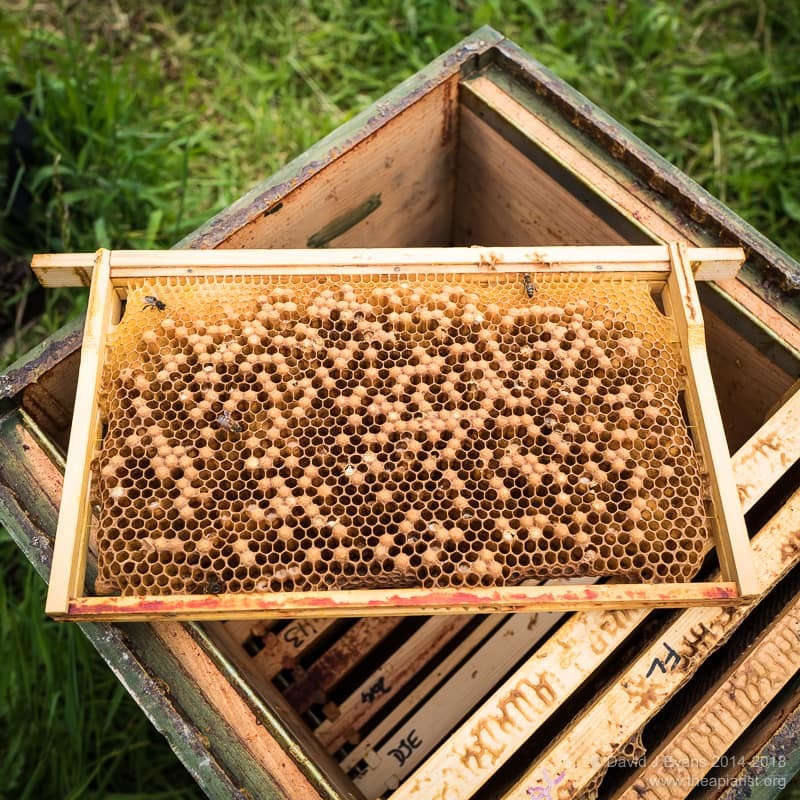 replace the original hive with a new floor facing the same direction, a brood box containing drawn comb, some stores, some foundation if needed and a single marked frame of eggs and young larvae placed centrally. Add the crownboard and roof. Queen cells … we’re saved! Of these two, the presence of queen cells is critical. If there are no QC’s then the colony still considers itself queenright. 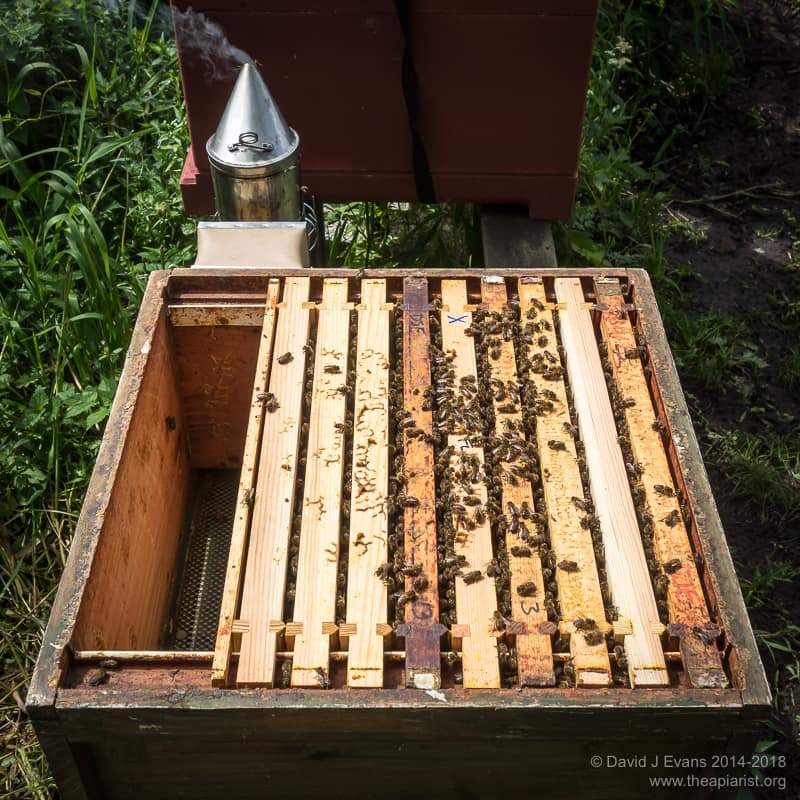 I’m afraid my interest and enthusiasm for saving the colony rapidly dwindles at this point and I usually shake the colony out again in front of other strong hives in the apiary (having removed the original hive completely so no bees can return to it †). allow the colony to raise their own queen, remembering that this takes time (perhaps 3-4 weeks) and that queen mating is both weather and drone dependent. If it’s late in the season it’s, at best, likely to be a risky strategy. requeening the colony using a mated queen from elsewhere, in which case add the queen cage adjacent to the introduced frame of brood. uniting with a queenright nuc, even one that isn’t overly strong. Since the receiving colony now knows it’s queenless they’re far more likely to accept the new queen. Nevertheless, you still need to use newspaper or one of the other methods that ensures the gentle merging of the two colonies. I usually discard the frames containing drones in worker brood, particularly those with a large number of occupied cells (see right). Alternatively, you can distribute them to other colonies in the same apiary. 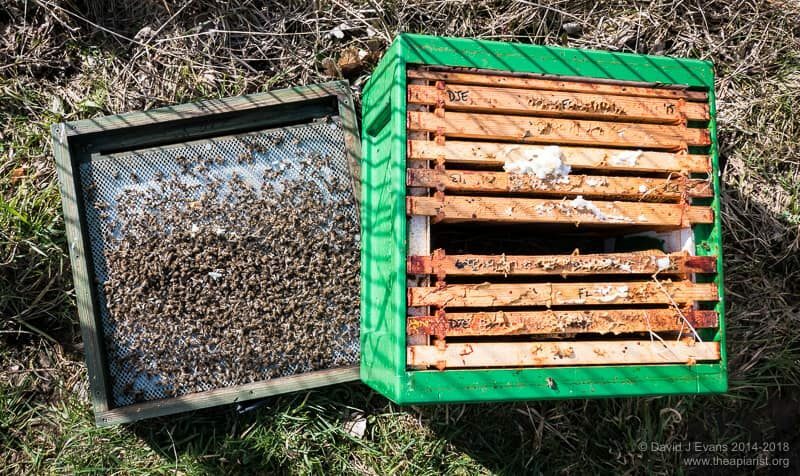 It’s best not to switch them between apiaries to prevent the spread of diseases. 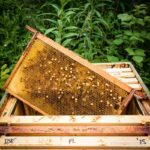 However, because of the high level of drifting and the movement of drones between colonies, hives in the same apiary can broadly considered as a single super-colony. 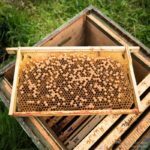 If there are frames of stores in the original colony they can be saved for use later in the season, remembering to protect them from robbing bees and wasps. it only requires a single frame of eggs and young larvae. Your other colonies are not significantly weakened while trying to ‘save’ the drone laying colony. it’s pretty quick. 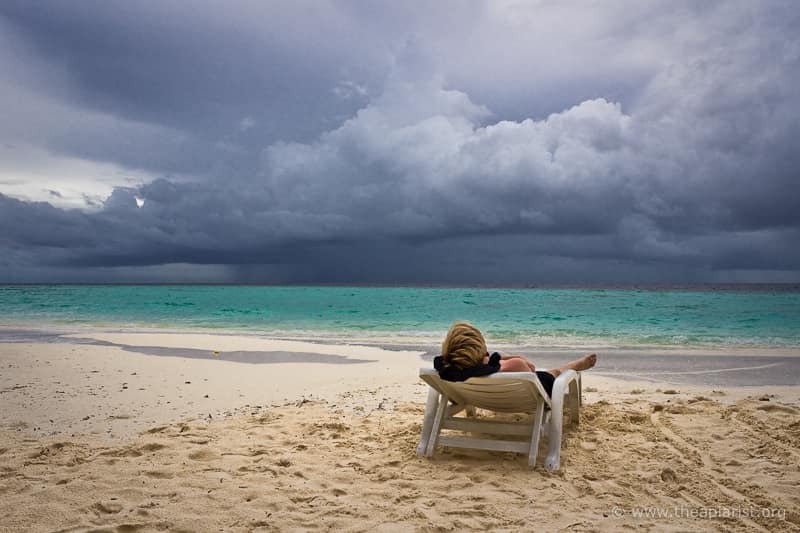 From diagnosis until you’re in a position to know you’re ready to proceed only takes three days. if successful (i.e. new QC’s) you can be reasonably confident the colony can be saved. And, as far as I’m concerned, if unsuccessful (i.e. no QC’s) I need spend no further time or resources on the colony. If you try this approach I’d be interested to hear how you get on with it. † it’s worth noting here that the majority of the shaken out colony will return to the nearest colony to their original location. 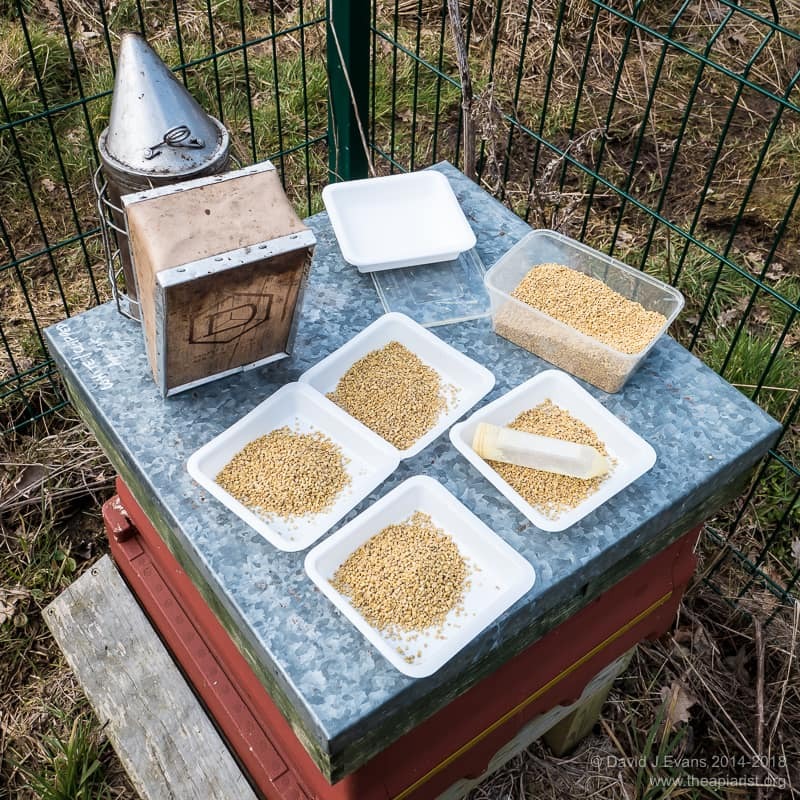 Do not leave an Apidea containing a recently mated queen, or a weak nucleus colony nearby or they will be inundated with bees … with potentially disastrous consequences. This entry was posted in Beekeeping, Queen failure and tagged DLW, Drone laying workers, Hopeless, queen cell, queenless on July 29, 2016 by David.